MELBOURNE, Australia—“Shen Yun for me is one of colour. It’s a veritable feast for the eyes. It fascinates me that we’re allowed to see something as grand and beautifully staged,” said George Donikian, Television News Anchor, radio and media professional, during the interval at the Shen Yun Performing Arts International Company’s performance at the State Theatre, Arts Centre Melbourne on Friday, evening March 28. Mr. Donikian felt that the inner beauty and passion emanating from the dancers gave the audience an extra level to appreciate. 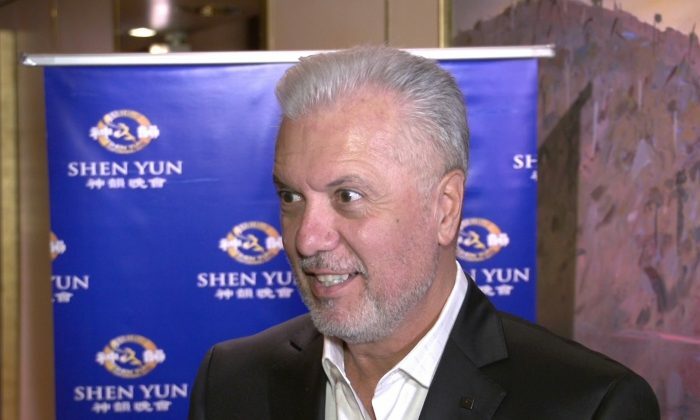 Mr. Donikian appreciated the experience of the Shen Yun performance. “One of the hardest things to do in theatre anywhere is to allow you to immerse yourself, to be totally engaged. And this particular program, the way they’ve created it, allows you to almost forget where you are and totally absorb this journey, 5,000 years back into this glorious time of China’s golden period,” he said. “Classical Chinese dance is at the heart of what Shen Yun does. Known for its incredible flips and spins, and its gentle elegance, it is one of the most rigorous and expressive art forms in the world,” the website explains. Rachael Yuning Bastick, originally from Toowoomba Queensland, Australia was the first soprano for the evening and she sang, “Why do you Refuse”. Ms. Bastick is also a principal dancer in the company. The second soprano, Min Jiang, singing “The Music is Truth” enthralled the audience. They were unable to contain their appreciation and burst into spontaneous applause even before she had finished. She was encouraged to perform an encore. Mr. Donikian felt that in this day and age it was so sad to see such a divine culture suppressed. “With state-of-the-art graphics technology, Shen Yun’s digital-backdrop team creates vividly animated settings, extending the stage and transporting the audience to a world where heaven and earth are one,” the company website explains. Mr. Donikian appreciated the digital backdrop and how it seems to interact with the dancers on stage. “I love the use of the new technology, all this interactivity,” he said. Mr. Donikan is a media professional with 30 years experience as a television news anchor, during which time has anchored news for Network Ten, Nine, and was the inaugural anchor for the SBS World News. He also has extensive radio experience as a news reader, presenter and talkback host. He is very community minded and committed to humanity and has various positions such as Redkite Ambassador, and Australia Day Ambassador.